Facebook wants to take over your phone. It aims to immediately immerse you in its social network with just a glance at the phone’s opening screen, without making you run its app or even unlock the device. Right from the lock screen of your phone, you’ll be able to see your Facebook news feed — including text posts and eye-catching, full-screen photos posted by friends — and to comment on, or Like items. 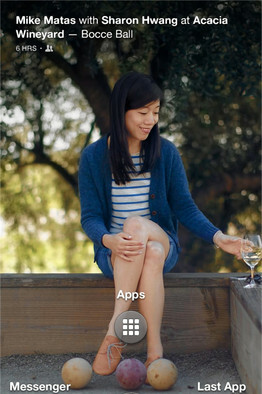 Facebook Home uses the lock screen to show new posts and other things. Also, with one swipe, you can go right to Facebook Messenger, the social network’s chat feature, to communicate directly with people and even send and receive text messages. All of this is possible before you even see the usual start or home screen of your phone filled with app icons, by using a new suite of software Facebook is introducing for Android phones on Friday called Facebook Home. The idea is that during spare moments — say, while waiting in a line — you’ll get immediately hooked by Facebook. Facebook Home, which replaces several key aspects of a phone in addition to the lock screen, will be an optional, free download for U.S. users at launch on four leading Android phones, including the very popular Samsung Galaxy S III. It also will be available that day, preloaded, on a midrange, $99 model, the HTC First, from AT&T. At least two other major Android phones also will be compatible when they hit the market. I’ve been testing Facebook Home for five days on the HTC First, but this isn’t a review of the phone hardware, which is unremarkable. I focused my testing on Facebook Home, the boldest attempt by any non-hardware company to alter a phone’s native user interface. Swipe your round photo to one of three icons: Facebook Messenger, app-launcher screen and Last App used. In effect, Facebook has created its own phone without having to build or sell hardware. The HTC First, so far the sole phone on which it’s preloaded, even boots up with the Facebook logo. I found Facebook Home to be easy to use, elegantly designed and addictive. Although I’m a regular Facebook user, I found that, with Home, I paid more attention than ever to my news feed, Liked items more often and used Facebook’s Messenger service more often. So, if you are a big Facebook fan, Facebook Home can be a big win. But I found some downsides. Facebook Home blocks the one-step camera icon some Android phone makers place on their lock screen to allow you to take pictures without first unlocking the phone. It also overlays other lock-screen features some Android phone makers include, such as weather information or favorite app icons. And if you do go to the icon-filled home screen, you’ll find that Facebook Home has taken that over as well, topping the screen with a bar that makes posting to Facebook easier and eliminating the bottom bar of heavily used apps. By default, the first of these Facebook Home app screens contains Facebook’s apps, including the popular Facebook-owned service, Instagram, plus apps from other companies, like Google Maps and Google Search, and the camera app. You can remove these and add others. With Home, Facebook is essentially staging a land grab of Android, the hugely successful mobile operating system made by one of its key rivals, Google. Facebook Home leaves all the standard Google apps in place and doesn’t alter the underlying Android operating system. But because it’s so dominant, it makes it less likely that a user with limited time will launch Google products that compete with Facebook, such as Google’s own social network, Google+, or rival services from other companies, such as Twitter. 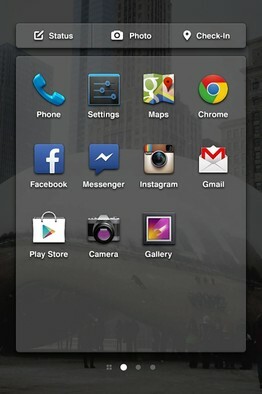 A Home app screen with Facebook’s apps, such as Instagram, and standard Android apps from Google. This is all made possible because Android allows third-party companies to alter the lock screen and other core features, such as the app launcher, which displays app icons and widgets. By contrast, Facebook Home can’t run on Apple’s iPhones, because Apple doesn’t allow others to take control of these core functions. Apple has integrated Facebook (and Twitter) to some degree into the iPhone, mainly by making it possible to sign into the services as part of its basic settings and to share almost any content to them easily. But that’s as far as it goes. When you first turn on the screen on a Home-equipped phone, you see the time and a small circle at the bottom displaying your Facebook profile picture. If you don’t touch the screen, your news feed, called the Cover Feed, starts to display, automatically scrolling from one post to the next. You also can manually swipe through the feed. Each post takes up the whole screen. If it’s a photo, it’s displayed in all its glory. If it’s a text post, the author’s larger wall photo appears faintly in the background. The effect is mesmerizing. If you want to Like a post, you can double-tap it or tap on a Like button. To comment, or read comments, you can tap on a comment icon. To get beyond the feed, you touch your little round picture and swipe it over to one of three icons that appear. Swipe up to see a home screen, or app launcher of your favorite app icons. Swipe left to go to Facebook Messenger. Swipe right to go to the last app used, whether it’s a Facebook app or not. 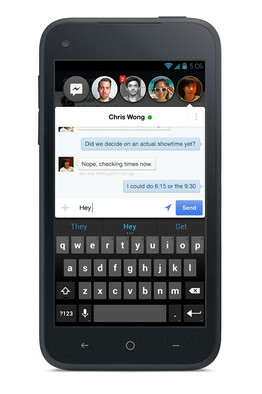 Facebook Home has another major feature: Chat Heads. These are the profile pictures of people who send you Facebook messages or text messages via Messenger. Unlike message notifications that appear only briefly on most phones, these remain visible, atop any app you’re using, tempting you to keep chatting via Facebook. You can move them around if they’re blocking something, but you can only get rid of them by dragging them off the screen to the bottom. Whether they annoy or delight you will depend on how much you use Facebook Messenger. 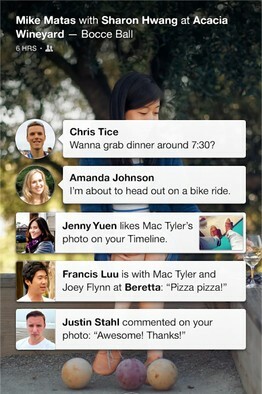 Chat Heads shows profile pictures of people who send you Facebook or text messages via Messenger. Facebook stresses that Home is purely optional. Nobody needs to install it, or buy the sole phone on which it’s preloaded. You can still use Facebook the way you always have — through the app. In fact, Home doesn’t fully replace the app, which has many more features. And you can turn all of it, or parts of it, off. I was able to turn it off even on the HTC First and also to require the phone to be unlocked before I could see my feed. Facebook says it hopes eventually to include feeds from other services, such as Twitter, in the automatic stream of updates on the lock screen. Even now, alerts — but not full posts or photos — from other products, such as Gmail or Twitter, appear on top of the news feed. However, this only works on the HTC First. Other phones only display Facebook alerts in Home. There aren’t any ads in Cover Feed currently but Facebook says there may be in the future. You cannot view customized news feeds, like ones containing only certain people, in Cover Feed. You also can’t compose new posts from the lock screen, though Facebook says it hopes to add that feature. Facebook Home is a very clever and very well-done product that will delight Facebook fans. If you aren’t in that category, or prefer the standard Android user interface, it won’t be right for you.